Morris is a little boy who loves using his imagination. 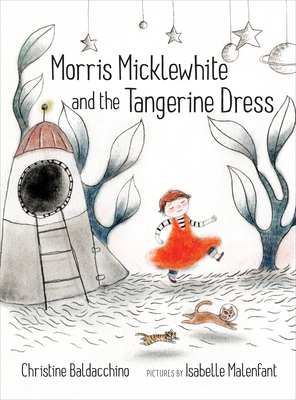 But most of all, Morris loves wearing the tangerine dress in his classroom's dress-up center. The children in Morris's class don't understand. Dresses, they say, are for girls. And Morris certainly isn't welcome in the spaceship some of his classmates are building. Astronauts, they say, don't wear dresses. One day when Morris feels all alone and sick from their taunts, his mother lets him stay home from school. Morris dreams of a fantastic space adventure with his cat, Moo. Inspired by his dream, Morris paints the incredible scene he saw and brings it with him to school. He builds his own spaceship, hangs his painting on the front of it and takes two of his classmates on an outer space adventure. With warm, dreamy illustrations, Isabelle Malenfant perfectly captures Morris's vulnerability and the vibrancy of his imagination.